Last week, I posted a story about the day Marian Anderson visited Bedford Elementary School. Buried in the piece was a quick line noting that the building now serves as Town Hall. Sure, our Myrtle Avenue seat of government looks like a school. But although generations of graduates think about their alma mater every time they drive by or see a reference to it on “06880,” I wonder how many Westporters who moved here since the 1979 conversion realize its history. 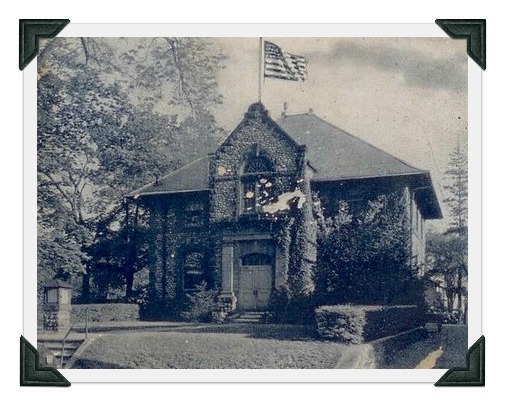 In 1917, the town voted to build a new school to serve children from “East and West Saugatuck, Cross Highway, Poplar Plains and Coleytown.” Major funding came from noted philanthropist (and Beachside Avenue resident) Edward T. Bedford. Eight years later he helped fund Greens Farms Elementary School, much closer to his estate. 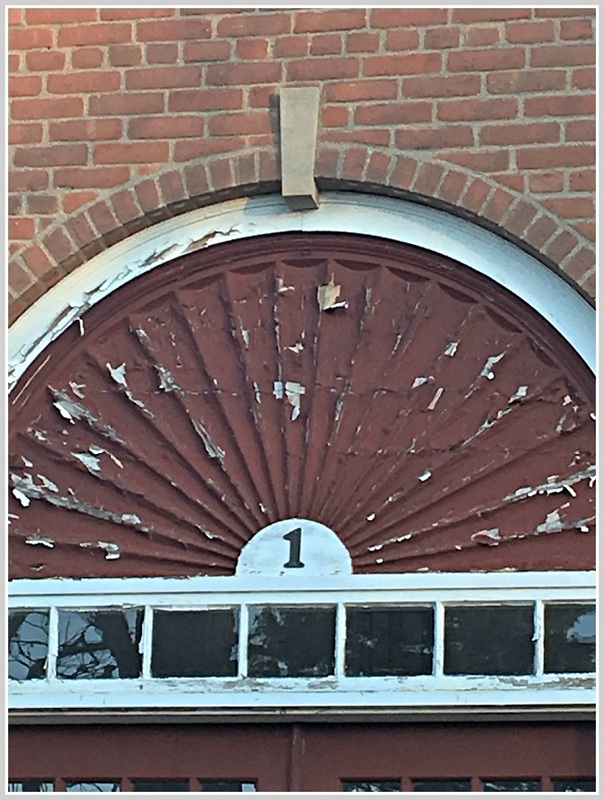 So if Town Hall is now at the old Bedford El, where was it originally? The Post Road. For decades, our town operated out of the handsome stone building next to what is today Restoration Hardware. The old Town Hall has been repurposed. 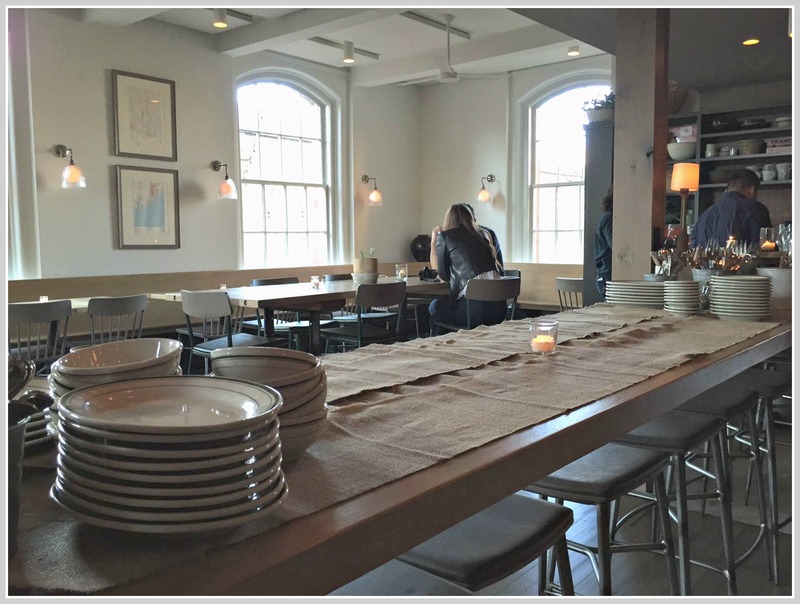 Westporters know it now for 2 great restaurants: Jesup Hall, and Rothbard Ale + Larder. There’s not much to remind you that it was once the center of government. Although the next time you’re in Rothbard, take a close look around. The basement once served as the police lockup. Last Sunday’s Photo Challenge showed a glass display case, with notices about dogs: registration, adoption, fixing. Apparently, no one. A couple of folks guessed Winslow Park. Logical, but wrong. Only Bob Colson said Town Hall. That’s where it is: Just outside the front door, at the top of the steps next to the big white column. Hopefully the info is also available at the Town Clerk’s office — the “spot” (ho ho) for dog licenses. This week’s Photo Challenge comes from Peter Barlow. 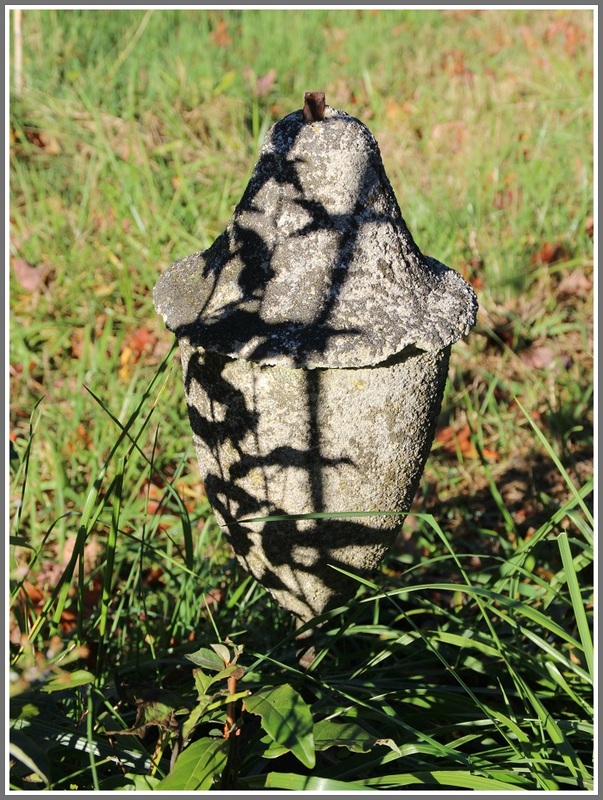 He offers 2 hints: This photo does not show the object’s original location. It’s now in his yard, but that’s not where Westporters would have seen it. And this is not the only one. At one point, there were a dozen or so. If you think you know where you might once have seen this, click “Comments” below. 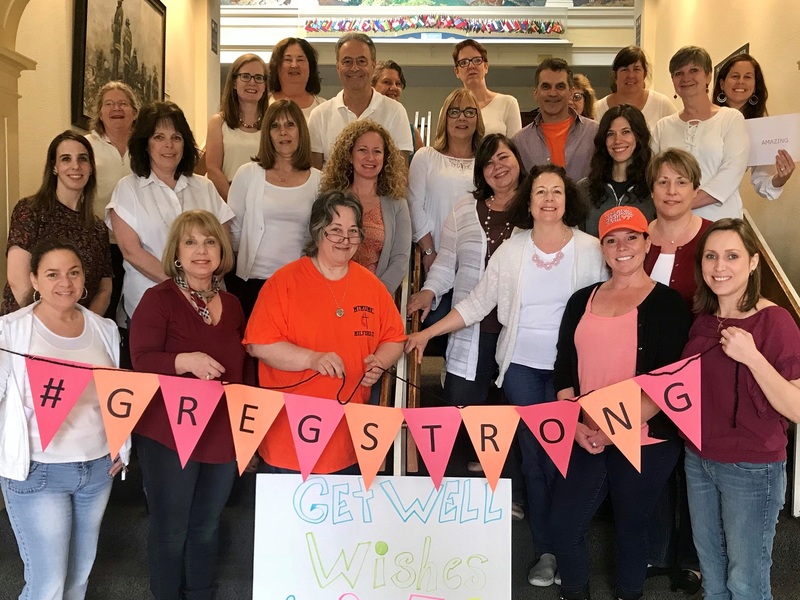 When Patty Strauss’ son Greg suffered a traumatic injury last month — he broke his back cliff-jumping, but lost his right foot below the knee — all of Westport rushed to help. We should. In over 20 years as town clerk, Patty has helped nearly everyone here. Folks in Town Hall were especially affected. She’s just one official among many, but her work is important to every department. 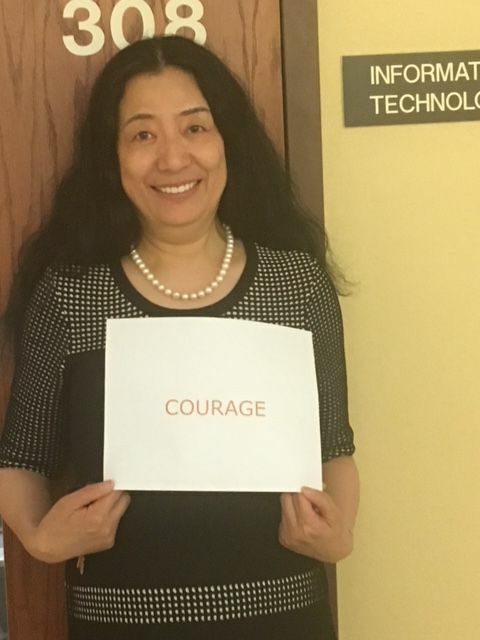 Her warmth and generosity has impacted every office. On Friday, nearly everyone in Town Hall wore Virginia Tech colors: maroon and burnt orange. Greg graduated from there just 4 months ago, and was working his dream job — crewing on a Caribbean yacht — when he was injured. Showing the Virginia Tech colors for Greg Strauss. They added messages of encouragement and inspiration. 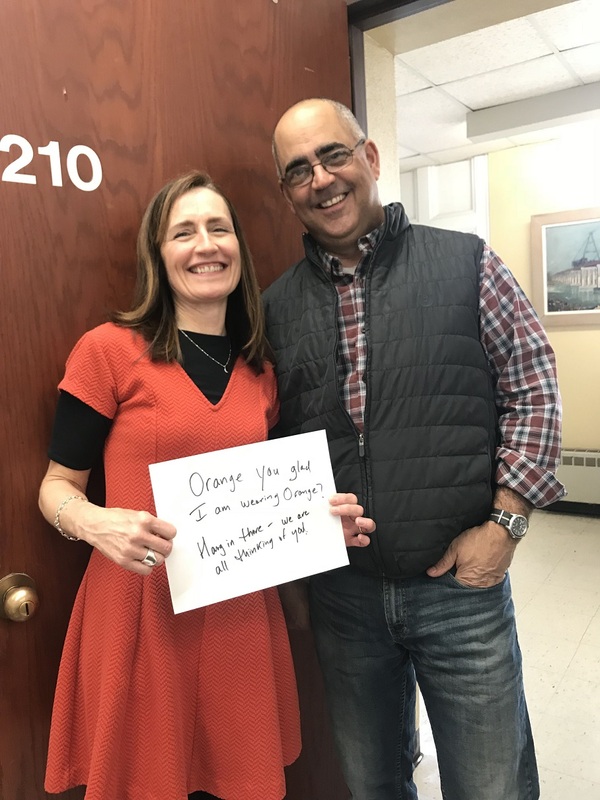 Those are small gestures, but they boosted Greg’s spirits — and of course Patty and her husband Ed’s too. 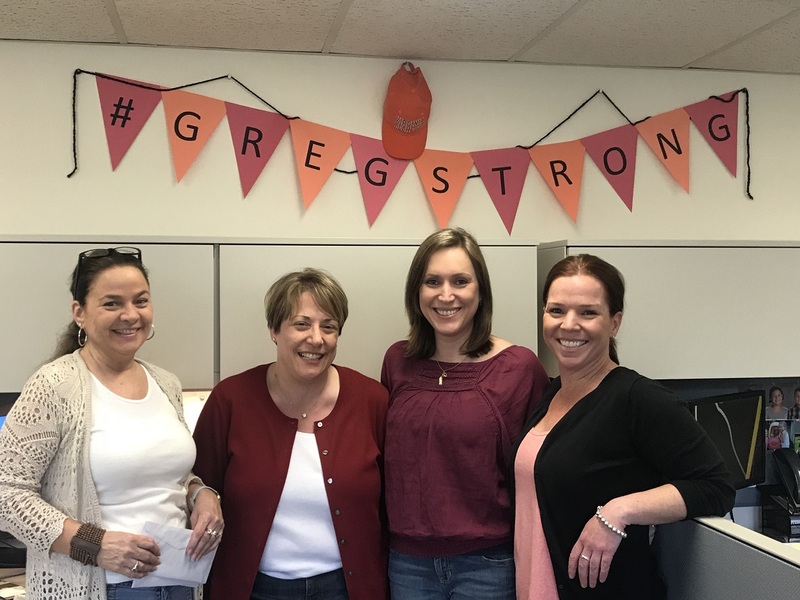 #GregStrong — started by Greg’s cousin — has caught on. Patty’s assistant Colleen Tarpey ordered stickers that will be sold soon. 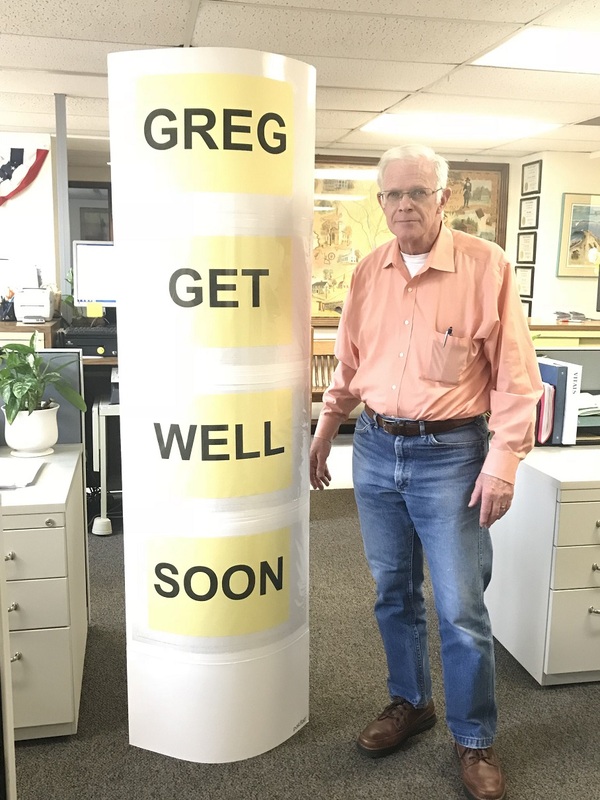 Many Town Hall employees and Westporters have contributed to a GoFundMe campaign, for Greg’s mounting medical expenses. We’re all giving back to Patty, in whatever way we can. Even non-employees sent best wishes. 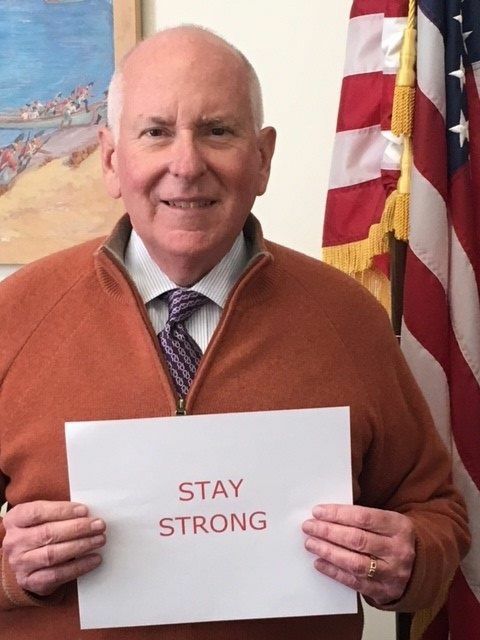 1st Selectman Jim Marpe — wearing Virginia Tech orange — joined the chorus of encouragement. In 1954, Aldous Huxley wrote “The Doors of Perception.” A dozen years later, Jim Morrison’s band took their name from that book. 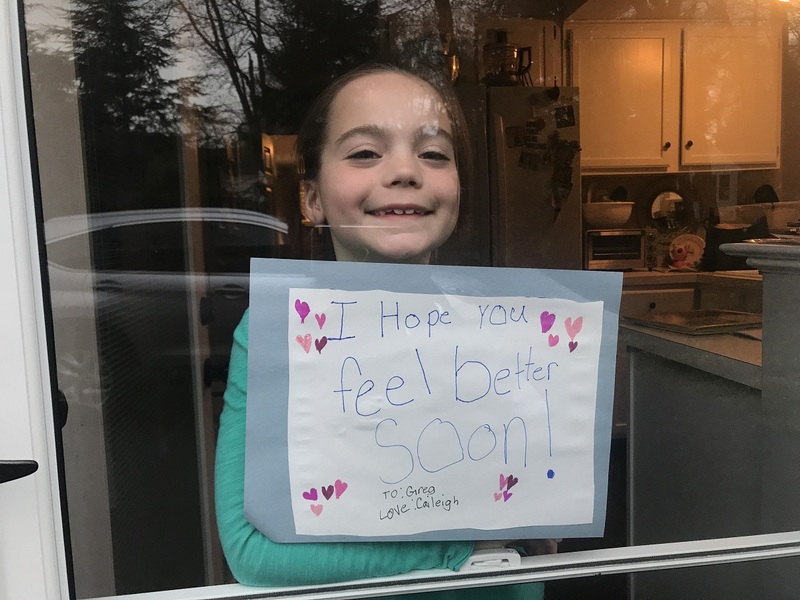 The view through a door window — of a potted plant — was taken at Town Hall. 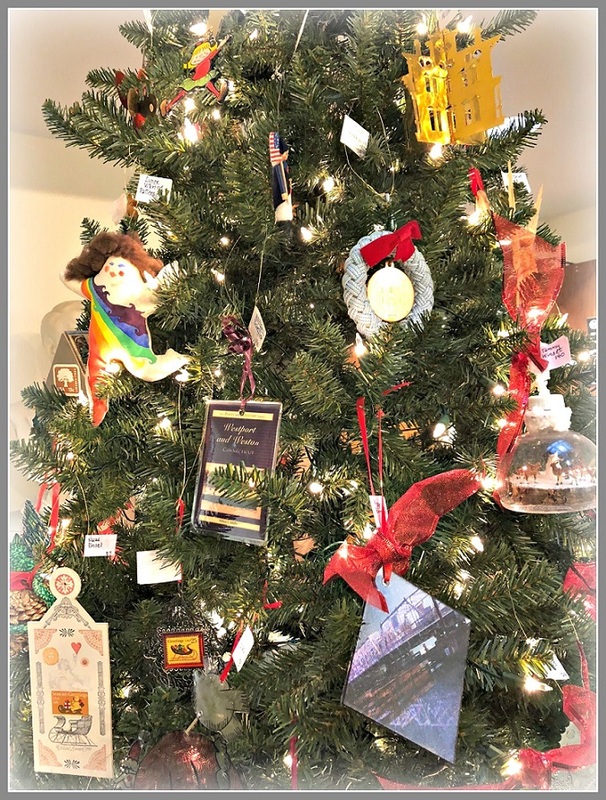 Andrew Colabella, Susan Schmidt, Susan Lloyd and Stephanie Ehrman were able to recognize that where-have-I-seen-it-before? shot. Wrong guesses included Earthplace and Greens Farms Elementary School. Now we open the door to this week’s challenge. 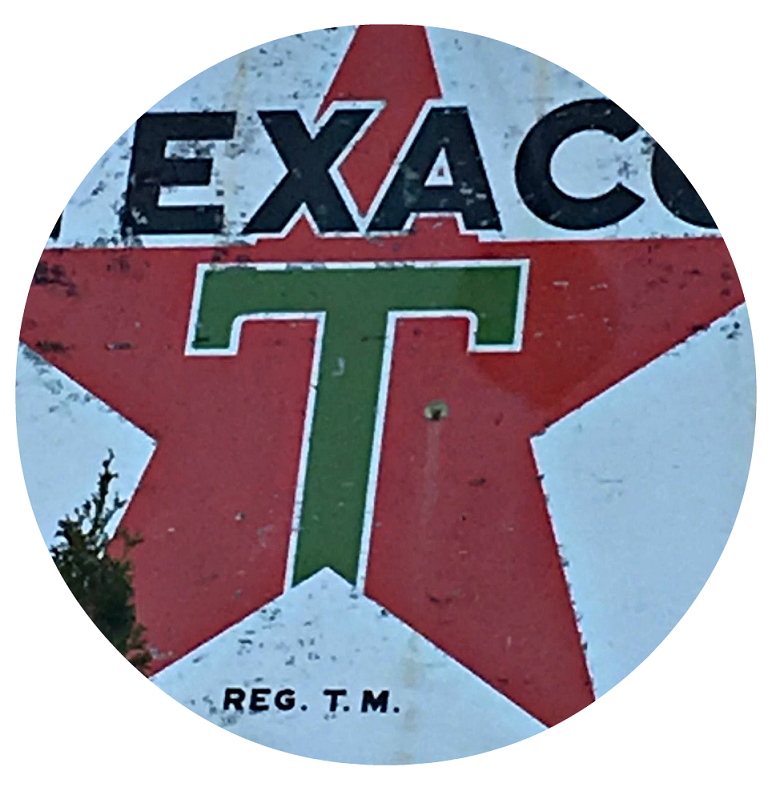 If you think you know where in Westport you’d see this, click “Comments” below. You’d think a plaque honoring all of Westport’s veterans — “living or dead” — would be located in a prominent spot. Veterans Green, probably. The VFW, perhaps. You’d also think that because it was dedicated in 1975, plenty of people would remember where it was. It’s not what our veterans deserve. The plaque is at the old Bertucci’s (and older: Clam Box) property, near where a memorial flagpole once stood. There’s a reason it’s there, and it has nothing to do with clams or pizza. For several decades, a Doughboy statue once graced the median, between the restaurant and Torno Hardware. It was relocated probably 20-25 years ago to Veterans Green (though it was not called that then). 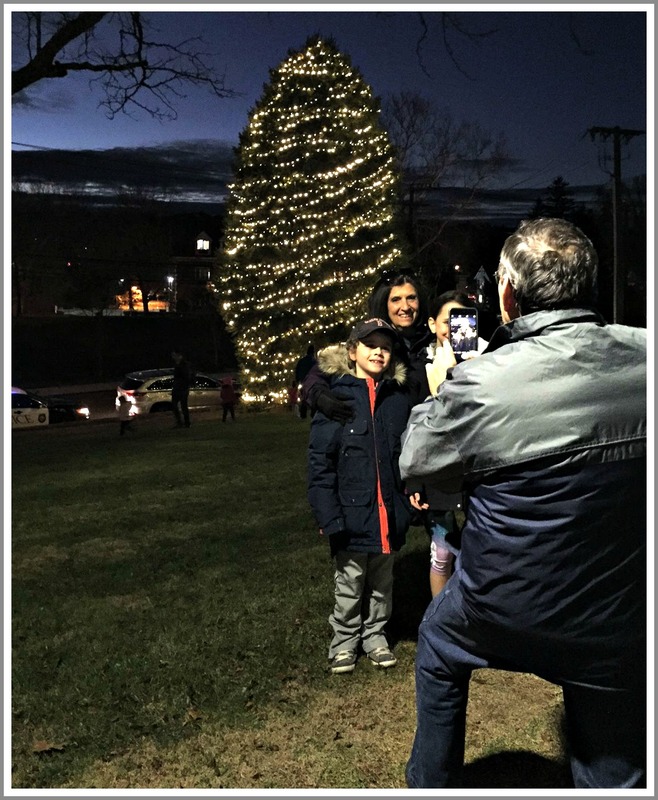 It’s certainly a more appropriate spot — across from Town Hall, next to the Westport Historical Society. Veteran’s Day is Saturday, November 11. Westport’s Town Hall ceremony is always inspiring — but lightly attended. Consider going (10:30 a.m.). School’s not in session that day, so bring the kids too. It’s a great way — besides a plaque — to honor our veterans. Now here’s this week’s photo challenge. 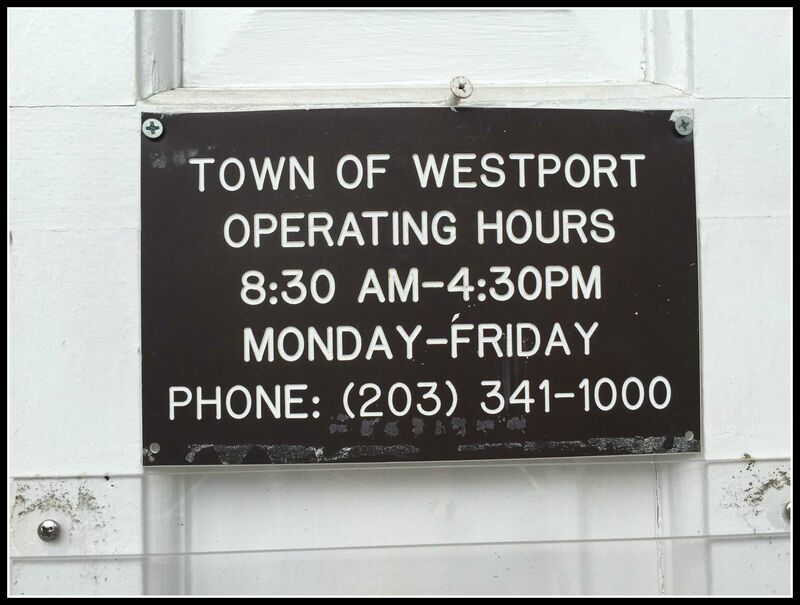 If you think you know where in Westport it is, click “Comments” below. Westport’s dining scene takes another giant step forward next week. And it does so with a gentle nod to the past. Jesup Hall opens Tuesday, in the old Town Hall. If you don’t know where that is: It’s the building with one restaurant already: Rothbard Ale + Larder. And if you don’t know where that is — it’s the building next to Restoration Hardware. Opposite Patagonia. The facade still says “Town Hall” (sort of). Starting next week though, 90 Post Road East will be known as Jesup Hall. Though it served as Town Hall (and, for many years, police headquarters) from its construction in 1907 through the 1970s, the Revivalist structure with a stone facade is often ignored. Now — thanks to talented restaurateur Bill Taibe — it will once again be smack in the middle of downtown action. Taibe — who owned Le Farm in Colonial Green, then opened The Whelk and Kawa Ni in Saugatuck — had been eyeing the Charles Street property that most recently housed the Blu Parrot (before that, Jasmine and the Arrow). But the deal did not work. When he heard the historic town hall was available, he knew it was perfect. Interior designer Kate Hauser — who worked with Taibe on the Whelk and Kawa Ni — has created a warm, welcoming environment in a very interesting space. With a long bar on one side, communal tables in the middle, and smaller tables (including a circular one) on the other side, Taibe envisions Jesup Hall as an all-day destination. He’ll serve lunch and dinner, plus — a first for him — Sunday brunch. Owner Bill Taibe, at a corner table. Patagonia can be seen through the windows, across the Post Road. Chef Dan Sabia — most recently at the Bedford Post Inn, who has worked with Mario Batali and Jean-Georges Vongerichten — specializes in large cuts of meat, and loves vegetables. The fennel, kale salad, cauliflower and lamb served last night were especially noteworthy. As with all of Taibe’s restaurants, local sourcing is important. “It will be seasonal, honest food,” Taibe says. He felt a responsibility to the building, he says. But calling his new restaurant Town Hall — as some people suggested — did not feel right. Then he thought about nearby Jesup Green. He researched the family. So Jesup Hall it was. One of the communal tables at Jesup Hall. Taibe makes sure all his employees know where they are — and who Morris Jesup was. He’s the grandson of Ebenezer Jesup, who owned the property we now call Jesup Green (and a nearby wharf). Morris funded the Westport Library (its original location, on the corner of the Post Road and Main Street, was dedicated in 1908, just a couple of months after he died). He also helped found the Young Men’s Christian Association — the national Y organization — and was a major contributor to the Arctic expeditions of Robert Peary, the Tuskegee Institute and the American Museum of Natural History (which he also served as president). The space has some challenges. There are two entrances — but one is set back from the Post Road; the other is in back, off the parking lot. That’s fine. In the summer, the front patio will be filled with tables, making for a lively outdoor scene. Other downtown restaurant announcements are coming soon. But right now, the 2 words to keep in mind are: Jesup Hall. Today is Veterans Day. Westporters — those who served our country, and those who simply wished to honor them — gathered in the Town Hall auditorium, for an 11 a.m. 11/11 ceremony. 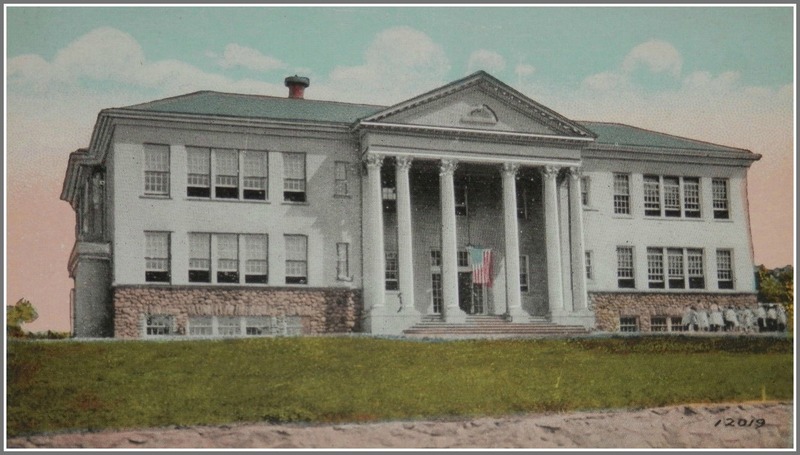 Back in the day — the World Wars I and II, Korean and Vietnam Wars day — Town Hall was located on the Post Road. It was a small, handsome building next to what was then the Fine Arts Theater. Today the old Town Hall is next door to Restoration Hardware — and it’s where you’ll find the Rothbard Ale + Larder restaurant. There’s another reason it’s appropriate to run this photo today. 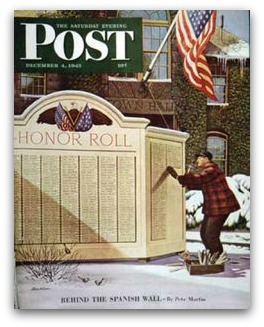 Stevan Dohanos’ December 1943 Saturday Evening Post cover showed our town’s Honor Roll. It celebrated all our citizens serving in the armed forces that year — quite a while after the above photo was taken. This was the 1st of Dohanos’ 136 covers for the magazine. Today the Honor Roll is part of Veterans Green, opposite the current Town Hall on Myrtle Avenue. Of course, there are many more names now than when Dohanos made Westport’s Town Hall famous, nationwide. 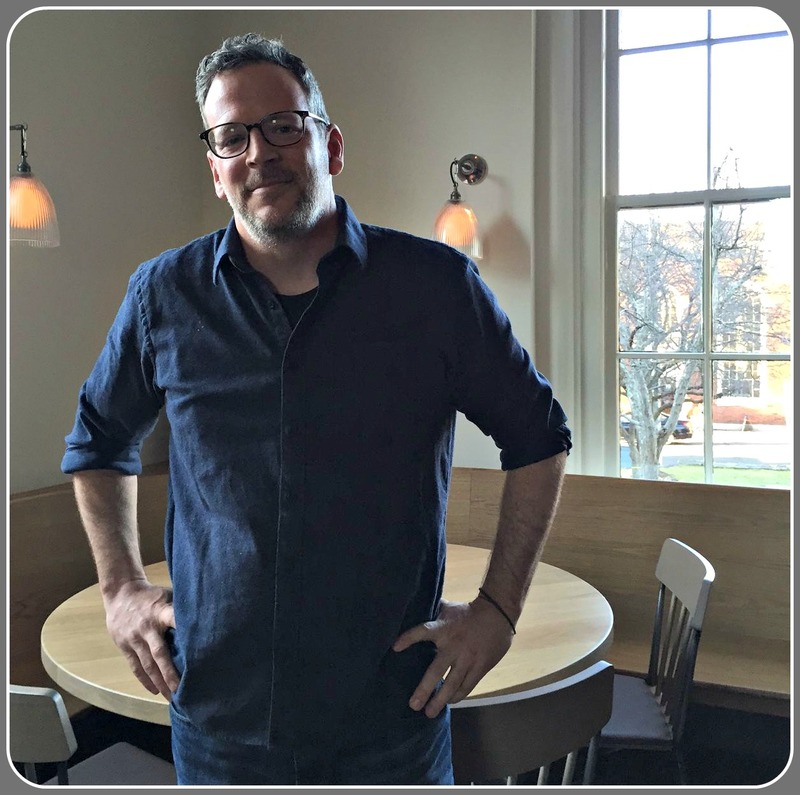 Starting with Le Farm — and continuing through the Whelk and Kawa Ni — Bill Taibe has offered diners 3 very different visions of what a great restaurant can be. Now he’s preparing a new space. It’s in Westport’s original Town Hall: the 1908 stone building next to Restoration Hardware on the Post Road, opposite Patagonia. The building already houses another dining spot — Rothbard Ale + Larder — in the lower level (once the town’s police headquarters, including a jail). 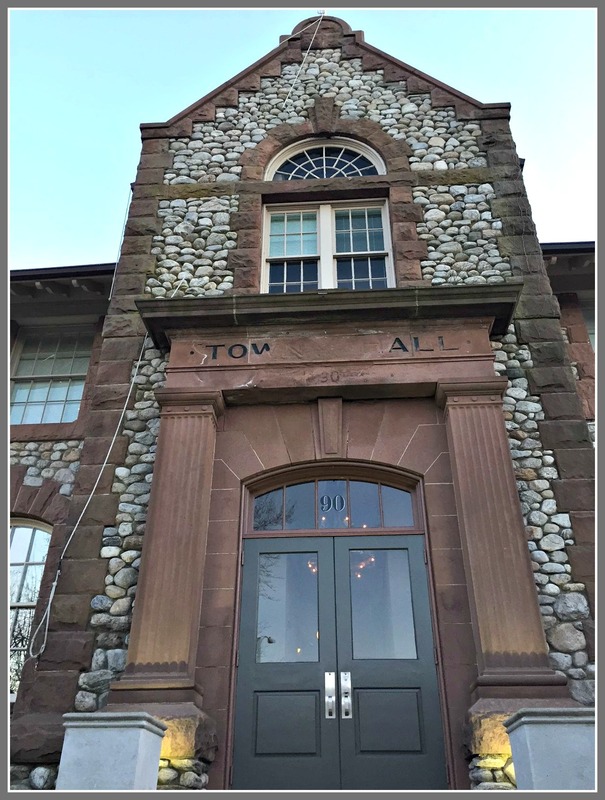 Westport’s original Town Hall, on the Post Road next to Restoration Hardware. It’s now home to Rothbard Ale + Larder — and, soon, a new Bill Taibe restaurant. He loves the downtown location, and the site’s historic bones. So even though his new, as-yet-unnamed restaurant is a work in progress, Bill knows one thing. He’s asking Westporters for old photos of the 1st Town Hall. You can donate other memorabilia too: menus or anything else from produce markets, shops, butchers, bakers, and fish mongers. You can find him at wtaibe@aol.com. Or any of his restaurants, current or future. Teenagers Always Complain, “Westport Is So Boring.” Here’s Why.